Set in 1811 and culminating at the Battle of Barossa, this 21st novel (which chronologically follows Sharpe's Escape) featuring the rifleman Richard Sharpe has the protagonist stuck in the Spanish city of Cadiz, with the task of recovering some incendiary letters by any means necessary. McGann speaks with a smooth British accent, and his voice conveys a blend of confidence and masculinity that ideally suits this tale of soldiering and warfare. This abridged adaptation is, for the most part, quite effective, but some characters-such as Fr. Salvador Montseny-feel as though they've been given short shrift. Also, the many protracted battle sequences interest at first, but quickly grow tedious, while the character-driven parts of the narrative feel neglected. 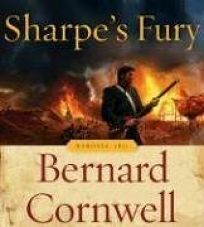 The audio works best when Cornwell is in storyteller mode; Sharpe is an engaging and likable hero, and the most entertaining parts of the book are those featuring him doing more than firing his rifle. Not Cornwell's or Sharpe's best, but fans should be pleased with this tale, even if the abridgment may leave them wanting more.